It feels like a month ago already, thanks to a visit last week from the Dreaded O, but here are some pictures from Switzerland. 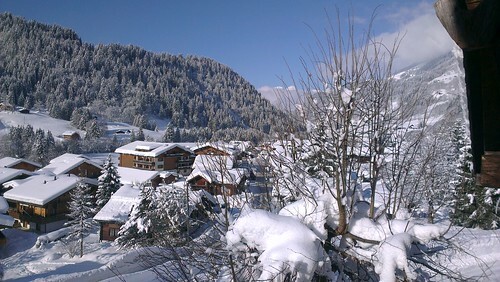 In terms of ski holidays, it was an utter disaster! 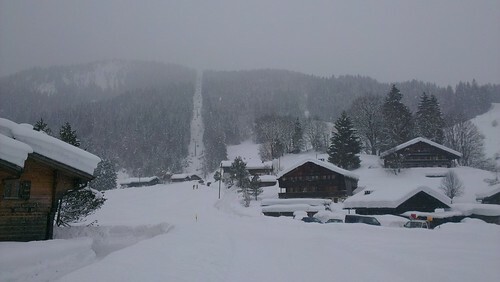 I skied on Monday afternoon, when I managed to snap both poles on my first trip up the lift thanks to not paying attention and had to borrow a pair of poles from the liftman to get back down; it was quite snowy and I was so demoralised I tramped back to the chalet, pulled off all my ski clothes and promptly fell into a five hour snooze. I was telling myself I would only stay in bed until I was properly warm, and that was how long it took. Tuesday wasn't much better. Not that I noticed. 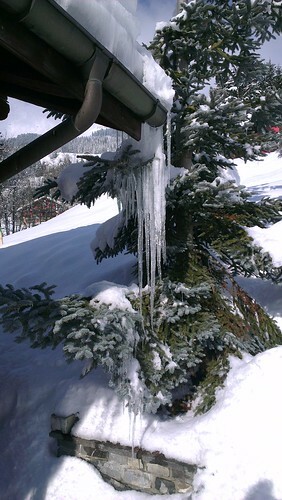 I managed to eat something that strongly disagreed with me and, as such, I was chained to the chalet all day. I spent the time dozing on the sofa and reading Dominion by C.J.Sansom - an absolutely cracking book that I managed to finish in two days. I can't remember the last time I devoured a book with such vigour. It was just as well, because I wasn't able to devour anything else. I forced down a vanilla croissant in the evening because it was Shrove Tuesday and I have given up sugar (as far as possible) for Lent, and didn't want to miss out on my last hurrah. But Tuesday was a bit pants other than that. I reckon I was probably only awake for 8-10 hours out of 24. By Wednesday morning the whole place looked like a chocolate box, or a postcard. It was so very lovely to look at, and actually relatively mild - all of 2 degrees, though it felt warmer in the sun. I gathered myself to go outside and have a walk, and buy new poles. When I finally mustered the strength to go and dig the steps out, something had been here before me! 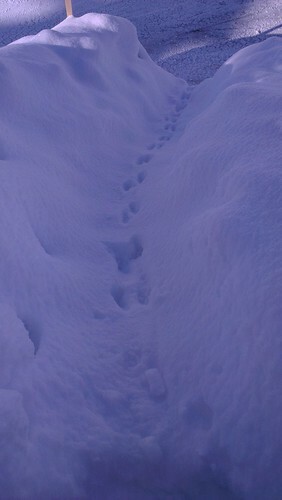 No idea what - with pairs of prints like that I am wondering if it was some kind of bunny, or a spritely deer. 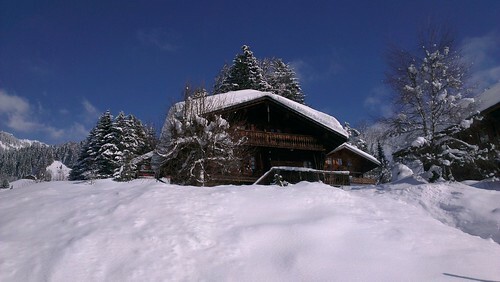 The chalet from the road. Very pretty! 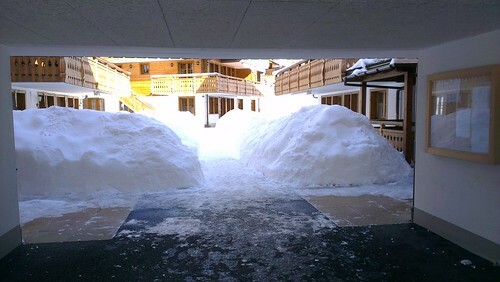 They get a considerable amount of snow in Les Diablerets. More than the last time we were there in 2011, at any rate. I can understand why the locals were so worried that year. 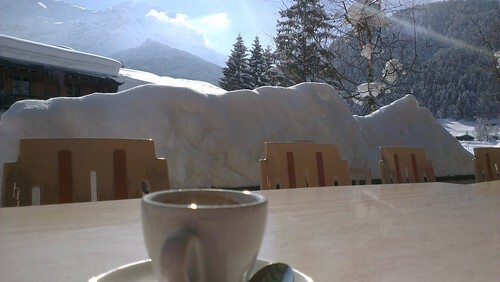 A hasty detour into a cafe in search of their facilities necessitated buying an espresso, which I enjoyed in the sun with this view. 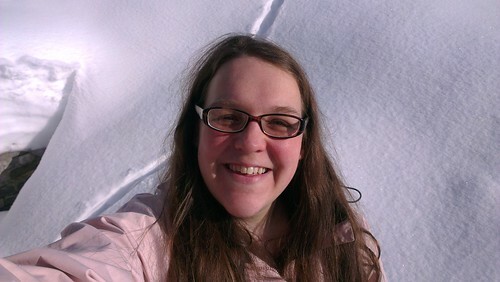 I sat outside under an awning with what sounded like rain drops pattering on it - the snow melting in the sun. There were many awesome icicles to be viewed as a result of this snow melt, but this one was the winner for me - on the corner of the house, and hanging not just onto the eave but also the tree. Impressive! At least I look rested. So, that was that. On Thursday, I came home. One run! Still, one run, better than none. It was very relaxing to spend time in a place where I didn't have to fret about tidying, or cleaning, or decluttering, or just doing this bit of work or that bit of marking. It was also a bit of an adventure to get there under my own steam on a foreign train system. Of course, when Ofsted rang I was sorry I hadn't spent a little more time working but - c'est la vie.